Don't Buy More Features Than You Need. Till now, if you wanted the outstanding quality of Sennheiser Wireless headsets you had to pay for a full featured model - even when you knew that you would not use all those features. That was the past. Now, Sennheiser can provide you with only the features that you will benefit from. Meet the "phone only" Sennheiser DW Pro 2 double ear wireless headset. 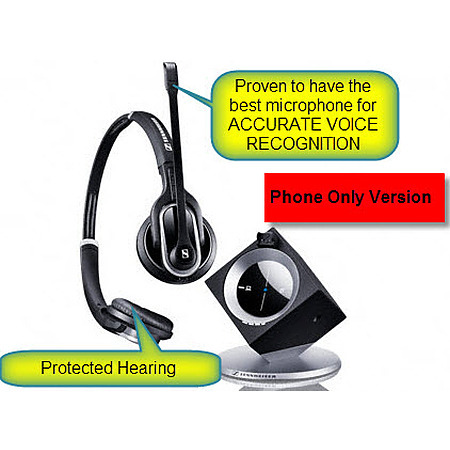 The DW Pro2 Phone is a double-sided DECT wireless headset that is built to enhance your day-to-day office communications. It is specially designed to meet the needs of all-day users and experienced professionals alike. This headset looks and sounds great with Sennheiser best-quality speakers and best ultra-noise cancelling microphone available. Ultra noise cancelling microphone filters out unwanted background noise, ensuring a clearer conversation.